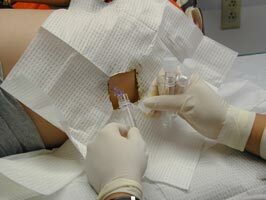 These are photos of Jonnie undergoing a lumbar puncture (or spinal tap), a diagnostic and chemotherapeutic procedure that leukemia patients undergo periodically during treatment. 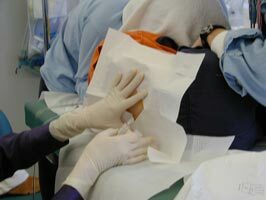 Spinal fluid is examined for signs of cancer relapse and methotrexate is administered into the spinal fluid to prevent cancer cells from spreading. 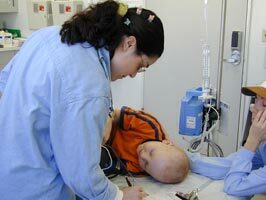 These photos may be difficult for some people to view, but this is the type of painful and frightening procedure kids with leukemia go through before being rewarded with a toy. Perhaps these photos will help you see for yourself why an incentive like a toy can help a child overcome fear and discomfort and reward them for their bravery or soothe them in their recovery. Jonnie gets ready for his lumbar puncture by playing with his favorite Crazy Bones toys. 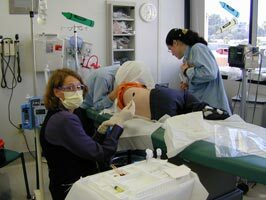 Nikki, the Physician's Assistant who will do the procedure, is partially pictured making preparations in the background. Nikki, the physician's assistant, who will be doing the procedure, feels for the right location for the puncture. Maria Lapinid, Jonnie's favorite nurse, helps get Jonnie into position for his procedure. He must curl up tight so that Nikki can get between the vertebrae to the spinal cord and into the cerebrospinal fluid. Nikki carefully and expertly inserts the needle. Nikki inserts the tap that will draw fluid. 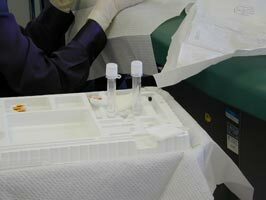 Fluid is collected in 3 vials for separate tests. Jonnie will still have plenty of cerebrospinal fluid. His brain and spinal cord carry about 150 milliliters of fluid and the fluid is formed at the rate of about 500 milliliters each day. The last vial is being partially filled. 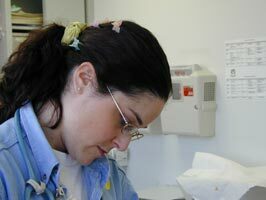 The yellow fluid is methotrexate, a chemotherapeutic agent, which is injected directly into the cerebrospinal fluid as a way around the "blood-brain barrier" which prevents chemo from crossing into the brain via the regular blood supply. Jonnie will leave his bandage on and avoid bathing for the next 24 hours. Nurse Annie Schwartz, Jonnie, and Mom (Jennifer Lanners). This is one of Jonnie's earlier lumbar punctures and he will be sedated this time. First Jonnie's back is swabbed with Betadine to clean and sterilize as much as possible. Jennifer, Jonnie's mom, helps Jonnie by going under his blanket with him. 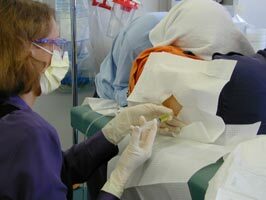 Kim, the physicians assistant doing the procedure, shows us the swabs she is using to apply the Betadine. Annie keeps track of Jonnie's vital signs. Annie Schwartz gives Jonnie a little more Versed to sedate him. He will be awake, but very sleepy throughout the procedure. Kim puts the paper in place that keeps the puncture area germ free. 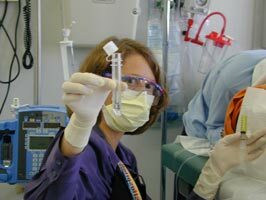 Kim collects the cerebrospinal fluid in clear vials. Three vials in all will be collected. There is only a small amount of fluid in each vial. Kim shows us the vial containing spinal fluid and in her other hand she holds up the syringe of Methotrexate that will be introduced into Jonnie's spine. A bandaid is applied. If you look closely you can also see where a small monitor lead is attached to Jonnie's back. Jonnie is very sleepy from his sedation, so Mom carries him out of the treatment room.